Joining BT as a graduate has been an amazing way to kick start my career. During the two year programme, I've had the chance to rotate around the business and work with different teams. This has provided me with a good exposure and understanding about what we do. The graduate community is a great support during the programme. Rolling off the programme, there were a lot of options, depending on your interests. I ended up moving to different country and working in a field that is totally different from my education background. Being on a graduate leadership and development programme is a huge plus for me. You rotate around different departments, giving you the opportunity to try different roles and learn different skills in a huge company. I especially loved our leadership training during our first year on the Programme. We spent a whole week doing various team-building exercises and developing our people management skills. The graduate community is amazing too, creating a great network both socially and professionally. I graduated from Hong Kong University of Science and Technology, studying a Dual Degree in Logistics, Engineering and Business Management. My current rotation is in Global Service Management where we look after our clients and help them fulfil business needs as we grow our partnerships in Asia. 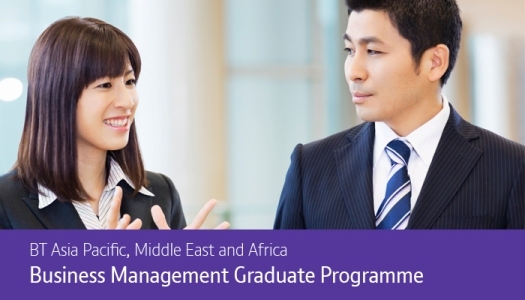 There are two things I really enjoy about the graduate programme: 1. We have great exposure to senior management team and can learn how important decisions are made in business organisation. 2. The people at our work place are very friendly and always willing to help, even though I often ask silly questions! Having great people to work with is what really gets you to wake up in the morning. I graduated from the University of York for my Bachelor's degree with a degree in Economics and Politics. I have also attained a Master's degree from the School of Oriental African Studies, with a Masters in Science in Globalisation and Development. I am currently working Business Operations. My current role spars across various areas, from audit and contract compliance, overseeing cost saving exercises to identifying and understanding account and product opportunities within the Asia Pacific region. With the opportunity to work on four different rotations across various departments, I am able to get a detailed understanding of the business and the industry from a variety of perspectives, be challenged within each placement of work and become a better all rounded individual. The greatest thing about BT is the culture and the people. People from various, diverse backgrounds and cultures come together and will be always willing to help you. They put their heart and soul to the BT community. You will see this come to fruition from the first week, by travelling to see BT in the United Kingdom for induction week. Like minded graduates from all corners of the globe, come together to share their experiences, excitement and get an in-depth understanding of the company from the leaders of the organisation. Most importantly, we get to understand how we could make a difference to an ambitious, multi-cultural and customer oriented organisation. It does not end there. With a leadership week to train your leadership skills as part of the training and development, the BT Business Management Programme is a scheme not to be missed. I graduated from Guangdong University of Foreign Studies with a double Bachelor degree in Business Administration and Economics. In addition, I attained my Masters in Finance from the University of Glasgow. I'm currently based in the BT Beijing office, providing assistance to the Regional Director of North China and the sales team. My daily job routine responsibilities include following up on sales orders and helping to create new pipelines opportunities and sales updates. I have also provided support to different sales programmes as well, such as the Ningxia eHealth Program and the Avic Trust Bid Program. What I like best about the graduate programme are the rotational opportunities to try out different roles from a wide variety of business units. This two-year graduate program offers four different roles, so I can easily build up my work experience, develop various skills and gain industry knowledge, and most importantly, I can identify which area of work I am passionate about. BT's diverse working culture allows me to work with people around the world, from where I could see how the business develop from each region and learn how people work together remotely. I enjoy working in the BT Beijing office very much with a lot of support and help from my colleagues! I graduated from University College London, after completing my BSc in Psychology. I am currently in my third rotation in Business Management for Global Banking & Financial Markets. Specifically, I've been involved in planning and executing a new go to market initiative. It has been a fantastic means to get involved in various aspects of the business - from how marketing plans are drafted up, to communicating with the wider company. What I like best about the graduate programme is the rotational experience, exposure to senior management and leadership training. I have worked in Business Operations and Human Resources for my first two rotations and it's great getting a hands on feel for what each team needs to deliver. Our senior management has been welcoming and supportive from the first day and we have had multiple roundtable sessions from our country leaders. My highlights from the programme were leadership week training and presenting at an external Human Resource conference. We had five days of off-site training, and I became more self-aware in what I wanted to develop and doing team building activities with BT graduates from across the global was fantastic building our networks. My opportunity to presenting externally with my line manager was also a testimony to me on how you can push and develop yourself during this program and beyond. One thing I love about this programme is that the company really welcomes and values new ideas from us graduates. We were asked to sit in on senior meetings and provide our thoughts and insights, and been given the opportunity to run company-wide events. Everyone, including the very senior managers, are helpful, cheerful and ready to give advice. The graduate programme is well-structured, and BT provides a lot of resources that we can use to help improve ourselves. I am having a great time working in this truly global company, and I look forward to stretching myself and exploring my potential in the rest of the programme. I was born and raised in Hong Kong, and graduated from the Hong Kong University of Science and Technology with a double major in Global Business and Management. I have held internships in several companies before joining BT, including National Australia Bank and Morgan Stanley. I joined BT Global Services because of the incredible opportunities it offers. Globally, and in Asia Pacific BT Global Services is an industry leader and highly respected brand, working alongside global financial institutions, international logistics companies, and some of the largest consumer goods companies in the world, among other multinational corporations. Since joining BT, the Graduate Programme has given me consistent exposure to senior leaders across the business. It gives graduates the opportunity to drive our own careers, and find out what we truly want to do through four rotations over two years. Graduates are given a huge amount of support and training by the business.